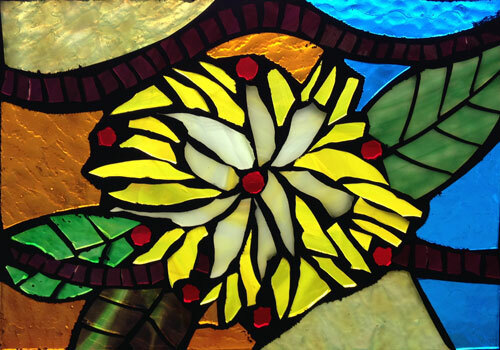 Streuter Technologies offers several different adhesive solutions for mosaic artists. Each one was developed for a specific use. So how do you know which one you should use? 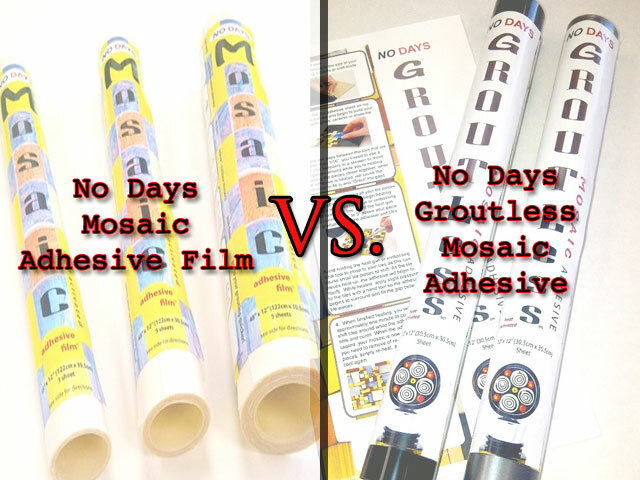 This post will hopefully help you to answer that question, specifically for No Days Mosaic Adhesive film vs. No Days Groutless Mosaic Adhesive. How do you decide which adhesive to use? No Days Mosaic Adhesive Film is dry-to-the-touch and comes in rolls of thin, film sheets that can be cut to size. It comes in “clear,” which has a yellowish tint to it. grout lines between tiles during heating. It comes in “clear,” pewter & black. 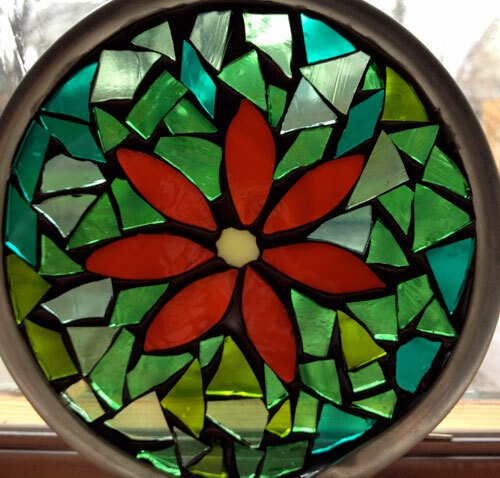 Various textured stained glass bits on plate glass. Looking through the flat glass, you can see where the adhesive is sticking (transparent) and where it’s not. the gaps to provide more surface area for a secure bond. If, however, you are using tiles like the ones above, you may opt to use No Days Groutless Mosaic Adhesive. 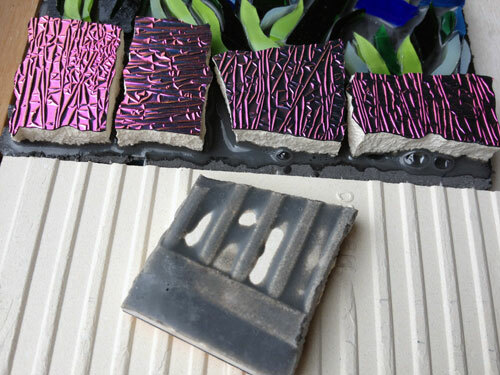 This gorgeous dichroic coated, ceramic tile from Coatings by Sandberg has a more textured back surface. That means that if you were using the mosaic adhesive film (which is thinner), that the adhesive wouldn’t be as strong because the surface area for the adhesive to grab onto is reduced. But, if you’re using the No Days Groutless (thicker), then there’s no worry that the adhesive is grabbing onto the tile. The tile in the foreground is a tile that was adhered on wedi board with Groutless in pewter, then reheated and pulled off. You can see where the adhesive grabbed onto the tile. The Groutless was developed for a teacher who wanted to skip the grouting process with her elementary school students because, well…it’s messy! It’s up to you whether or not you want to grout after the tiles are in place. 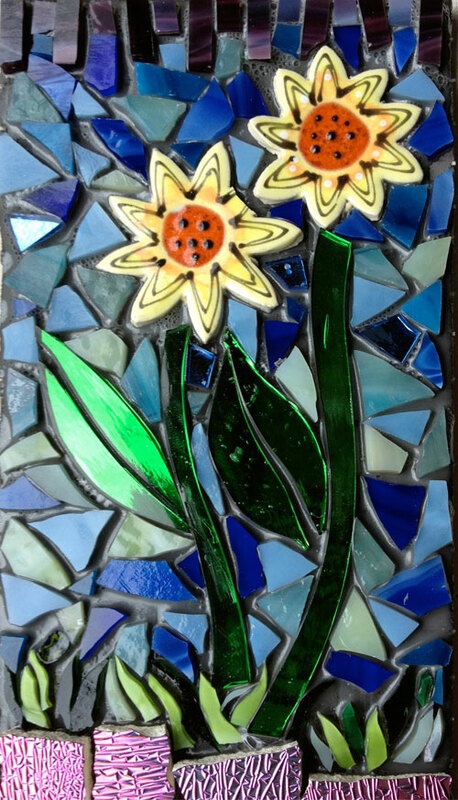 The sunflower piece above has been adhered with pewter on wedi board. I am going to grout this piece, but used the Groutless Mosaic Adhesive because the ceramic tiles I used needed a little more adhesive to grab onto them. By the way, you can use the No Days Groutless Mosaic Adhesive for glass on glass mosaics, and I’ve got some great secrets to share. But…that’s gonna have to wait for another post! 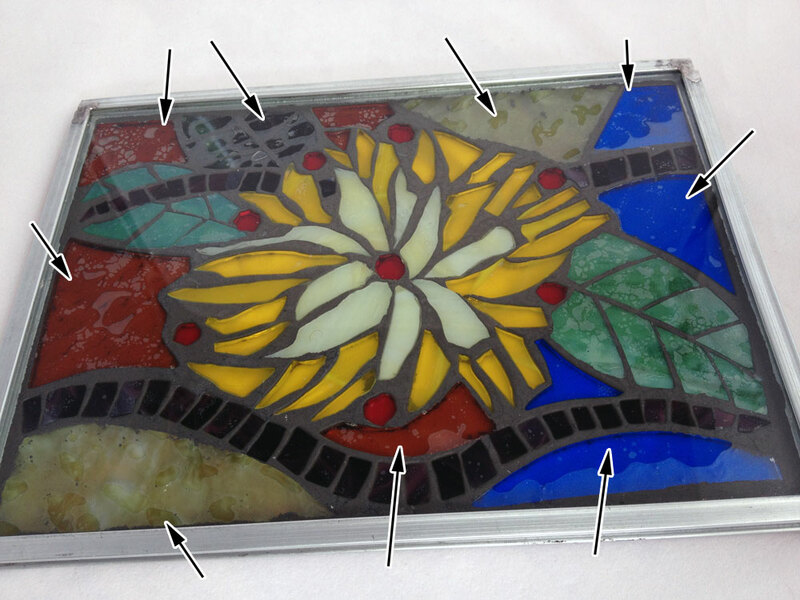 Can you explain how the glass on glass mosaic is constructed? So you grouted the project and did not use the groutless adhesive.